I spent some time trying to google the issue, but could find nothing except comments on Andrew Connell’s blog where Anuja Bhojani suggested some sort of workaround and mentioned that the issue appears when custom outcome column is created from code. Solution: Check whether your workflow task list contains duplicate columns. If so then delete unnecessary copy and most likely it will start working. If it is not your case, double-check whether you set “Task content type” and “Outcome Field” correctly. Also make sure that you checked for duplicates in the task list your WF associated with and not in another similar one. You can check what task list your WF uses on the workflow settings page. At the same page you can open associated task list by pressing “Open task list” link. Why it happened in my case: I created my custom task content types programmatically. During some tests I deleted these content types from the task list, but fields remained. After that I created task content types programmatically again and new columns with the same names, but different guids appeared. After adding new content types to the task list it started to contain duplicate columns (because their IDs were different). Hope it saves somebody some time :-). 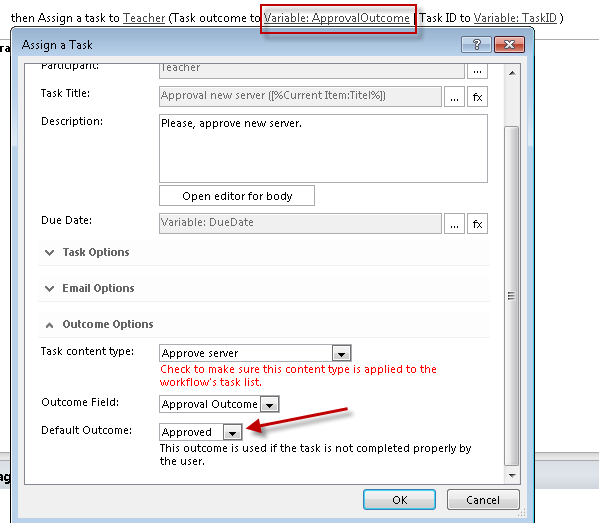 This entry was posted in SPD Workflows and tagged 2013, custom task form, SPD, task form, workflows by admin. Bookmark the permalink. That is why Microsoft suggests to use separate WorkflowTaskLists for each task contenttype used.